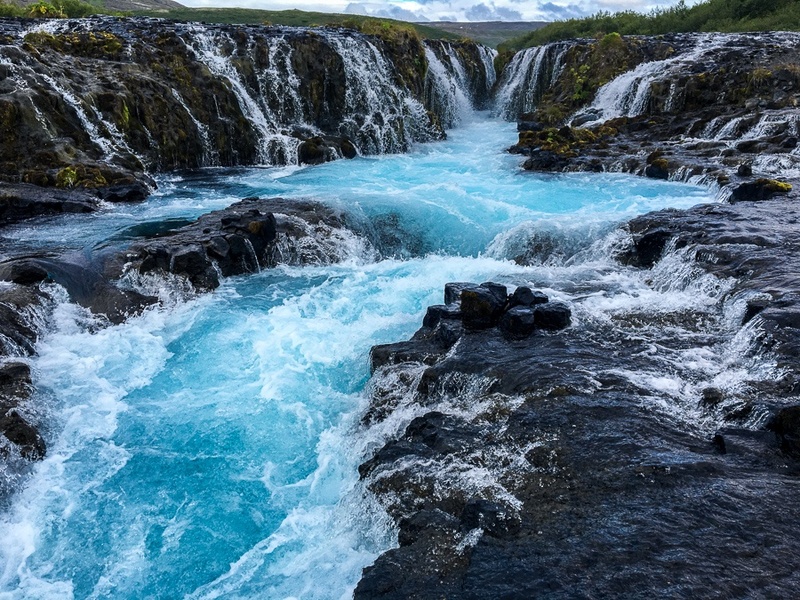 I think Bruarfoss wins the award for bluest waterfall in the country of Iceland, and possibly the bluest waterfall anywhere in the world. This one is a pretty simple waterfall running into a crevice in the rocks, but you have to admire the colors of the black volcanic rocks mixed with the perfect blue glacier water. It’s just unreal. Sadly the landowners have restricted access to this waterfall since 2018 because they said it was getting too many visitors and litter. I didn’t see any litter here when I visited in 2017, so I’m not sure if that’s an accurate claim, but oh well. The good news is that it’s still possible to reach Bruarfoss by hiking, and the other good news is that there is a 2nd waterfall (Midfoss) that you pass on this hike that is almost incredible as Bruarfoss. Two amazing waterfalls in one hike! The correcting parking lot for Bruarfoss is located 60 miles (95 km) from Reykjavik, and the drive takes about 1.5 hours. From the parking lot, the hike to the falls is 2.8 miles (4.5 km) one way, but it’s mostly flat. The trail can be muddy and slippery at times, so you’ll want to bring the right shoes. The map below shows the location of the waterfall in relation to the parking spot, but the trail itself actually follows along the edge of the river. Finding the right direction to go should be pretty easy once you reach the parking lot below. No parking or entry fee is required.